so what have you been doing these past two days? aside from visiting the dead, that is. since we go visit the dead whenever we want, we decided to do some spring cleaning. or should that be autumn cleaning? whatever. all we know is that it's that time of the year when our favorite charities ask for donations. so we decided to go through our shoe boxes and shoe closets and weed out shoes we haven't worn in oh five years. and we can't tell you how many pairs we tossed into a balikbayan box, all to be given away. these were shoes we haven't worn in 10 years! ugh. when was the last time you wore pointy-toe, kitten-heeled mules?? so we were left with [relatively] newer shoes stored in their original boxes. and empty shoe cabinets. DUSTY shoe cabinets. hence, the autumn cleaning. so we brought out the vacuum cleaner (which is so damn loud we have to plug our ears with those yellow rubbery ear plugs given away in airlines), attached the little round brush, and brushed and vacuumed those damn shelves. which wasn't enough. the shelves were still black and stained and crusty with dust and molds and dirt from the bottoms of our shoes. ugh. 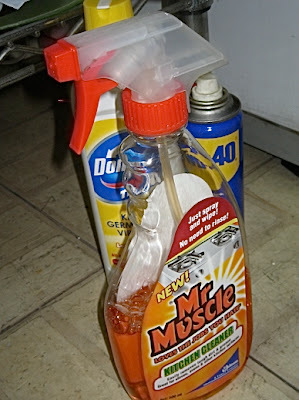 to the rescue: mr. muscle! we swear this is some miracle product. just spray and swipe and voila! sparkling clean shelves! effortless. no scrubbing and scraping required. we use it on EVERYTHING: sink, shower, stove top, walls, doors... hmmm, we wonder if we can use this on our shoes and bags... of course there were lots of shelves to brush and vacuum and spray and swipe—parang workout. now we're tired. oooh we just know it, our whole body is going to ache tomorrow. we wish we had a real, live, in-the-flesh mr. muscle to do all this work. ugh.